The cement plant commenced operations in 2014 and is located on 184 hectares within a valley of the Tha Pyae mountain range. The closest community is Kyubin village (56 households) located some 3 km north of the plant. This village is accessed via a road that bypasses the plant and connects with the main access road to the site. This main access road connects with the larger community of Pyi-Nyaung (535 households) which is located approximately 7 km south of the site. Pyi-Nyaung is situated adjacent to a major road which connects Thazi town to Taunggyi, the capital of Shan State which is 72 km away from the site. Beyond these villages there are no other communities in proximity to the site. STM operate the mudstone and limestone quarries and a coal mine located in Sagaing region in western Myanmar, about 150 km from the plant site which supplies coal to the cement plant, its sole customer for coal. The coal mine covers an area of some 1,376 hectares and is 15 km in length and 900 meters wide. The villages of Paluzawa (59 households), Chaungzon (19 households) and Nanmawke (14 households) are located 5 km to the west of the mine and are the only communities located in proximity to the facility. Coal extraction is via the open cast method with annual production currently at some 60,000 tons per annum and this will increase to 150,000 tons once the expansion is complete. Additional coal as required by the cement plant is sourced locally from suppliers and traders which supply to various customers and not exclusively to STC. Following the expansion, coal may need to be imported as well. Coal from the mine is transported via a 5 km road and then stored at a staging area located adjacent to the Chindwin River. From this point the coal is transported via barge to Mandalay and then by road to the plant which is some 220 km. The coal mine only operates during the dry season for up to 6 months and stockpiles coal for the remaining time of the year as used at the cement plant. There is a small office and fuel storage area adjacent to the coal staging area, while the main storage area and machinery / vehicle staging areas for the coal mine along with accommodation facilities for workers is located at a base camp situated near the Paluzawa village. As part of the project a new unpaved 5 km road will be built to connect the staging area and the coal mine. HTC currently has 16 concrete batching plants located throughout Myanmar. The largest facility which is located in Yangon occupies 2 hectares and has a 90 m3 and 60 m3 per hour batching plant. HTC alsois operating with 155 concrete mixer vehicles of which 102 operate in the broader Yangon area. Sand and aggregate is supplied in bulk to this facility via barge and from here these materials are dispatched to other plants via road; cement is supplied in bulk to all plants and is sourced via STC, or from other manufactures. 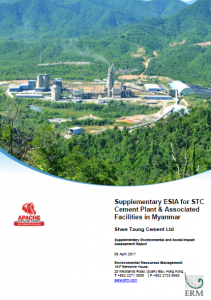 The document presenting the Supplementary Environmental and Social Impact Assessment Report for STC Cement Plant & Associated Facilities in Myanmar can be downloaded here. All land associated with the project inclusive of the coal mine is leased from the Government. Original construction of the cement plant and coal mine did not result in physical displacement of local communities. In 2008 as part of road widening in an area between Pyi Nyaung and the cement plant, the company acquired a small area on which 5 households from Pyi Nyaung were growing bananas and paddy rice. These households were compensated for loss of crops based on negotiated values which reflected prevailing market rates of crops at that time. The 5 households mainly grew bananas and paddy rice for subsistence with such activities constituting a minor portion of their income/livelihoods, thus the impacts were not significant. No physical or economic displacement is required to accommodate the expanded cement operations. In addition, as a result of improved access roads constructed by STC so as to build the cement plant, access to forest areas by communities has been enhanced. This has facilitated improved community livelihoods which have been further supported via the direct and indirect economic benefits of having the cement plant operations in the respective areas. In respect of HTC’s operations, all the plants are located in industrial areas with a number of the key facilities such as those operating in Yangon being in existence for 20 years. Based on the above and taking into account the economic displacement occurred in 2008 and livelihoods were not significantly impacted, PS5: Land Acquisition and Involuntary Resettlement is not considered applicable. There are several Indigenous Peoples groups (or ethnic minorities as per Myanmar laws) residing in 3 of the 5 communities within the broader project area i.e., in Kubyin (60% of whom are Danu and mostly second generation with Burmese and Danu parents, and 14% Kayin, and several Shan families), Pyi-Nyaung (several Danu families), and Paluzawa (several Kachin households out of a total of 59 households). These groups co-inhabit with the mainstream Burman ethnic group. IFC’s review including interviews with ethnic minority groups determined that: i) the project will not have adverse impacts on ethnic minority villagers; and ii) forests and local natural resources within the project footprint are not considered by ethnic minority peoples to be of customary/ancestral/traditional tenure. As such, PS7: Indigenous Peoples is not considered applicable to this project. During the various environmental and social impact assessments undertaken for the project no issues related to cultural heritage were identified at any of the operations, thus PS8: Cultural Heritage is not considered applicable to the project. The project is defined as a category A project according to IFC’s Policy on Environmental and Social Sustainability as it has the potential for significant adverse environmental impacts. These impacts relate primarily to biodiversity given the land where the limestone quarry for the cement plant and the area where the coal mine are located are defined as Critical Habitat in accordance with PS6: Biodiversity Conservation and Sustainable Management of Living Natural Resources. Other than the issue outlined above, other key environmental and social (E&S) issues associated with the project include; i) the need to enhance existing environmental and occupational health and safety management systems allied to capacity to ensure effective implementation thereof; ii) need for strengthening the approach to human resource management to ensure alignment with Performance Standard 2: Labor and Working Conditions; iii) management of point source and fugitive dust emissions; iv) solid and liquid waste management including the storage of hazardous materials aligned with accepted practices; v) stormwater management; vi) effective management of traffic and transportation in the vicinity of the plant and on public roads; and vi) focused and sustained stakeholder engagement, notably with the communities in the vicinity of the cement plant and the coal mine. In addition, there is a need to further assess specific aspects related to water management and biodiversity so as to inform the project. IFC’s appraisal considered the environmental and social management planning process and documentation for the project and gaps, if any, between these and IFC’s requirements. Where necessary, corrective measures, intended to close these gaps within a reasonable period of time, are summarized in the paragraphs that follow and (if applicable) in an agreed Environmental and Social Action Plan (ESAP). Through the implementation of these measures, the project is expected to be designed and operated in accordance with Performance Standards objectives. Potential E&S impacts associated with the project may be substantive unless effectively mitigated and currently STC has limited capacity to ensure effective management of such issues. Further, taking into account the impact on forest resources that have been induced due to establishment of the cement plant and to a lesser extent the mine, and that these are beyond the control of the company, the contextual risks associated with the project are considered significant. STC is though committed to compliance with IFC’s requirements and commissioned an international consultancy to undertake an assessment of E&S issues aligned with the Performance Standards and develop associated management plans for the project’s construction and operational phase. Going forward the company will engage independent experts to support development of their environmental and occupational health and safety management systems so as to ensure management of the identified E&S impacts. Similarly, there will be independent review of the project’s management plans for construction and operations to ensure effective implementation. Finally, IFC will also ensure enhanced support to STC on E&S issues throughout the investment process. In this manner and while acknowledging the risks and impacts associated with the project, it considered that the project can achieve compliance with IFC E&S requirements. In 2014 STC commissioned a local company, National Engineering and Planning Services, to undertake an Environmental Impact Assessment (EIA) for the initial development of the cement plant. This was submitted to the regulatory authorities in accordance with the then prevailing Myanmar EIA procedures. In 2016 STC commissioned further EIA’s for the cement plant expansion and the coal mine respectively in compliance with relevant legislation. These were also undertaken by a local organization, the Myanmar Environment Sustainable Conservation Company. No assessment is required under the current Myanmar EIA procedures for the new transmission line. For the most part the line will be constructed within the right of way for the existing 11kV line. STC will ensure alignment of the new line maximizes usage of the existing right of way and thereby minimizes potential impacts associated the new line. In doing so the company will obtain support from an independent and qualified E&S consultant; this requirement is defined in the ESAP. In addition, STC will apply the Environmental and Social Management Plans (ESMP) for the construction and operational phases as referenced below to this activity. Going forward STC are required to ensure the necessary regulatory approvals are obtained for the project. So as to ensure alignment with IFC’s Performance Standards, STC commissioned ERM, an international consultancy, to undertake an Environmental and Social Impact Assessment (ESIA) of the cement plant expansion project inclusive of activities associated with the coal mine. This assessment commenced in October 2016 and as of publication of this Environmental and Social Review Summary (ESRS) document, has culminated in the issuance of a draft ESIA report which is disclosed along with the ESRS. The ESIA focused on the cement plant and mine inclusive of a new road from the staging area to the mine so as to assess potential environmental and social impacts and associated mitigation measures related to; i) construction issues related to noise, emissions, waste management, influx of construction workers and worker accommodation; and ii) operational aspects related to point source and fugitive emissions, solid and liquid waste management, stormwater management, land clearance and related biodiversity aspects. In addition, the assessment included stakeholder engagement inclusive of that with communities to identify issues and concerns and ensure ongoing focused interaction with stakeholders during construction and operations. The ESIA includes various specialist studies one of which focuses on biodiversity. Given the period in which the assessment has been undertaken, it has only been feasible to undertake dry season biodiversity surveys to date. The wet season biodiversity surveys will commence at the onset of the rainy season which is anticipated to be in May 2017. Once the wet season biodiversity survey data is received, the ESIA will be updated and finalized. Similarly, the ESRS and the Environmental and Social Action Plan (ESAP) will also be updated to reflect the findings. As outlined in the sections that follow, given the findings associated with biodiversity surveys thus far allied to the habitat designation for the limestone quarry and coal mine in accordance with PS6: Biodiversity Conservation and Sustainable Management of Living Natural Resources, it is considered that the potential risks and impacts as identified in this ESRS are not likely to change significantly following issuance of the final updated ESIA report which will include findings of the wet season biodiversity surveys. Taking into account the local EIA’s completed inclusive of the ESIA to ensure alignment with IFC’s Performance Standards, it is considered that for the most part environmental and social impacts associated with the project have been adequately assessed. However, further review is required on the approach to liquid waste management, water availability to support the waste heat recovery unit and confirmation that the new road for the cement plant is optimally located. Actions are defined in the ESAP to ensure such aspects are adequately addressed prior to project implementation. STC has a comprehensive Health, Safety Environmental and Quality Policy signed by the Managing Director. Further, all operations i.e., the cement plant, coal mine and ready mix operations, have an occupational health and safety (OHS) management system including a set of associated procedures. Implementation of the management system at the cement plant and mine is though not as advanced as at the ready mix operations. The latter activities have been in existence for some 20 years as opposed to the plant and mine which started operating recently. Thus as per the ESAP, STC is required to enhance implementation of the OHS management system at the cement plant and mine aligned with the requirements of this Performance Standard. This will be supported by an initial OHS audit by an independent consultant to define gaps relative to good international industry practice allied to a follow up audit based on an agreed schedule with IFC to ensure adequate implementation of the associated systems. Formal environmental management systems across all operations are limited with the need for defined objectives and targets, management plans and associated procedures. The draft ESIA includes Environmental and Social Management Plans (ESMP) for the construction and operations stages and defines the need to develop and implement specific plans e.g., contractor management, waste management and monitoring. Thus this forms a good starting point for the development of Environmental Management System (EMS). As per the ESAP STC is required to develop and implement an EMS which includes the ESMP to ensure alignment of activities with the requirements of this Performance Standard for all operations i.e., the cement plant, STM and HTC. Review of the EMS by an independent consultant will be linked with the OHS audit referenced to ensure adequate implementation thereof. Four of the HTC plants are certified compliant with ISO 9001 standards for quality management, and while not certified, all other plants apply similar systems and are allied to the ASTM International Standards; the latter is confirmed via regular internal audits. STM is in the process of developing an OHS department and at the time of the site visit there was only one safety representative for all activities with departmental heads being responsible for safety. Currently there is no dedicated environmental officer for the operations. At the coal mine the Mining Manager is responsible for safety. HTC has a full-time Safety Manager based at the main plant in Yangon, and all other ready mix plants have a safety officer. All officers need to have relevant certifications confirming that they have safety training and preferably working experience in safety prior to being employed. STC acknowledge the need to enhance capacity so as to support effective implementation of environmental and OHS management systems and have committed to employing a suitably qualified Environmental, Health and Safety (EHS) Manager at the cement plant who will also be responsible for activities at the mine. This individual will be supported by a commensurate number of in-house personnel at the cement plant and mine inclusive of one dedicated stakeholder engagement officer. The EHS Manager will have dedicated budget and a direct line of reporting to the STC CEO. These actions are defined in the ESAP. Given the size and scope of HTC’s operations, safety officers can also assume responsibility for environmental aspects on-site. All the ISO 9001 certified ready- mix plants have dedicated quality officers and quality management at the remaining plants is the responsibility of the associated manager. STC has a documented emergency response plan and while there was initial training on the plan implementation in 2014 when the cement plant operations commenced, since this time training has been irregular and there have been no annual fire drills. There are fire hydrants located throughout the plant, however there is no scheduled maintenance plan for these. The plant is in the process of acquiring a fire truck. The mine has no formal emergency response plan, though there are fire extinguishers readily available at the base camp and at the facilities located in proximity to the coal staging area. HTC has a documented emergency response plan and the plant visited had adequate signage throughout the plant, an assembly area, fire extinguishers readily available and a scheduled maintenance plan for these. This plant and the other 3 main plants all have fire pumps; all fire equipment is checked on a monthly basis and there are annual fire drills. Review of the approach to emergency response will be undertaken as part of the EMS review referenced above and as defined in the ESAP. Active implementation of the EMS will also result in a more standardized approach to emergency response including regular training and drills. Aside from monitoring as part of the OHS management system, monitoring systems are limited across all operations. A monitoring plan will thus be developed as part of the EMS to include key elements related to OHS, and environmental and social aspects and this will be assessed as part of the independent review; the latter is a requirement for cement plant, mine and HTC. The monitoring plan will also define reporting requirements such that key performance indicators related to OHS and environmental aspects are reported promptly via the EHS Manager to the STC CEO and ultimately the STC Group CEO. The cement plant has 357 permanent staff and 280 on long term contracts. Of the permanent workers, 99 are women. Once the project expansion is complete, an additional 80 workers will be employed. At the mine there are 60 workers the majority of whom are male. HTC has 747 permanent full time workers of which 152 are women. Only the cement plant employs short term (daily paid) workers with 25 plant cleaners and 24 workers for packing and cleaning. The cement plant has a Human Resources Manager and some 20 support personnel and the scope thereof also includes the mine, while HTC also has a Human Resources Manager and 15 support staff at the primary facility in Yangon; at the individual ready mix plants the Plant Supervisor is responsible for human resource issues. The ShweTaung Group has a detailed Code of Conduct that applies to all employees. While there is no overarching Human Resources Policy, the Code of Conduct includes various policy statements in the introduction that are considered to adequately address this aspect. Policy statements include; i) Human Rights and Labor Rights Policy Statement whereby support for the United Nations Universal Declaration of Human Rights is acknowledged allied to the International Labor Organizations Core Conventions and Principles; ii) an Anti-Corruption and Anti-Bribery Policy Statement which also includes a clear commitment to complying with relevant national laws and regulations; iii) Workplace Health and Safety; iv) Conflict of Interest; and v) Land and Property Acquisition which notes the need to ensure affected communities rights are protected and respected. Working hours are 48 hours per week for production workers and 44 hours for others as defined by law. Aside from daily workers, all workers have a detailed signed contract defining the terms of employment including their salary and a signed acknowledgement of the Code of Conduct (this document is signed by the employer, employee and Government). STC pays above the minimum wage and offers various benefits to workers. Leave benefits offered to staff relate to that for annual, medical, maternity and wedding leave. An annual bonus is paid to workers with contracts along with production bonuses where applicable. The company arranges life insurance for workers with contracts and makes a contribution to social security payments (workers’ pay 2% and the company 3%) to Government which affords all workers access to medical facilities for free. Workers are also required to make a monthly saving contributions which the company matches and should a worker leave the company, they obtain access to the full savings. Staff at HTC receive a travelling allowance and meal allowance while workers at the cement plant and mine receive all meals as part of their employment package. No workers reside on-site at the HTC operations, while at the cement plant, other than community members employed from the communities in direct proximity to the plant, all workers reside on-site. This applies similarly at the coal mine where all workers reside at the base camp. Staff quarters are deemed to be adequate and in alignment with IFC’s requirements for worker accommodation at both the cement plant and the coal mine. Two junior staff share one accommodation unit, while more senior staff have a unit on their own and family accommodation is also available for all staff. STC is in the process of constructing a new staff accommodation village and staff will relocate from the existing quarters to this village as and when the varying units become available; this is aligned with IFC’s requirements for worker accommodation. Contractor accommodation will be necessary and the specifications for such will be defined in the contractor management plan to be developed as part of ESAP to ensure alignment with IFC’s requirements. A canteen is available for workers at the cement plant and the facility is of an adequate standard. At the limestone quarry there is also a covered area where workers may eat. However, for the mine base camp most of the workers reside with their families and thus a large formal canteen is not required. The Code of Conduct states the company respects worker rights to freedom association and collective bargaining, however currently no employees are members of a union. A clear policy statement is included in the Code of Conduct regarding the fact that STC is an equal opportunity employer and noting the requirement for non-discrimination across all facets of the employment process. There is also a policy regarding Anti-Harassment and Anti-Bullying and an internal procedure to deal with such issues within the company. STC is expanding operations and none of the individual subsidiaries expect to retrench workers, rather new workers are to be employed at both the cement plant and HTC. The Code of Conduct includes a clearly defined grievance mechanism whereby grievances are addressed via a Code of Conduct committee and note the need to maintain the anonymity of the complainant where applicable. However, there is a need to allow for fully anonymous reporting and thus as per the ESAP, STC will develop and implement the associated requirement. In accordance with national legislation the minimum age is 18 years and the company does not use forced labor in any of its operations. This requirement is also clearly stated in the Code of Conduct. The age of workers is verified via official identity documentation upon employment. STC will ensure that the contractor management plan for the EPC contractor and others includes requirements on ensuring the non-occurrence of the use of child and forced labor at all times; the contractor management procedure referenced below will include an inspection mechanism to monitor this. As noted the cement plant inclusive of the mine is in the process of developing OHS capacity and there is a Health, Safety, Environmental Rules & Regulations Handbook which defines procedures for various activities such as permit requirements for specific tasks, isolation and tagging requirements, working at heights etc. Job safety and hazard risk assessments at the task level were in the process of being initiated at the time of appraisal. Monthly safety meetings have been initiated which are attended by all the departmental heads. Minutes of these meetings were reviewed during the appraisal. Safety induction is provided to all workers upon employment and ongoing safety training is conducted. In addition, weekly tool box talks are also undertaken for workers at the coal mine and the limestone quarry. Training records from the last 2 years were assessed which indicate there is general safety training including some focused on key areas such as mechanical and safety aspects. Personal protective equipment (PPE) is available to all workers at the cement plant and the mine. Team leaders / supervisors are responsible for ensuring workers use PPE and workers are not allowed on-site without such equipment. During the appraisal the observed use of PPE was high. While the approach to OHS management at the mining / quarrying operations is seemingly more well defined than at the cement plant, there is a need for a more structured approach to OHS management, allied to a coordinated approach to training at both the cement plant and mine. This issue will be addressed via the OHS audits as previously referenced and defined in the ESAP to ensure effective implementation of the required management system. First aid training has been conducted for staff at the cement plant and mine, and there is a trained first aider on each shift and first aid kits available in all departments and on-site at the mine. The cement plant and mine both have clinics staffed by qualified personnel and the cement plant is in the process of acquiring an ambulance. Where workers cannot be treated on-site, they are taken to a nearby hospital. There is a procedure for incident reporting, though recording of incidents only commenced since 2015. At the cement plant two fatalities were recorded in 2015 along with 12 lost time injuries (LTI) and 4 first aid cases, while until September 2016, 8 LTI were recorded along with 3 first aid cases. No information was available on the nature of the incidents. There is no documented information on the mine, though it was reported that no LTI’s have occurred since operations commenced. The ESAP action to enhance the OHS management includes a specific requirement to formalize the incident reporting across all the operations of STC i.e. the cement plant, mine and HTC, including the need for corrective actions following incidents and near misses. HTC has adequate personnel to manage OHS allied to defined procedures for relevant tasks and there is regular training. PPE is available to all staff and the observed use on site was high. All the large sites have a clinic while the smaller facilities have first aid facilities and workers can be taken to a hospital if necessary. Since HTC commenced operations some 20 years previously, there has been one fatality. In 2015 and 2016 there were 8 LTI’s respectively and information is provided on the nature of the incidents, root cause analysis and corrective and preventive actions taken. Monitoring of key performance indicators e.g., incidents, lost time injury severity rates, will also be undertaken, and regularly reported to senior management at the individual operations, and Group level. The only workers contracted by any of the STC operations would be those typically associated with construction activities and in the short term this will relate primarily to the construction workers for the cement plant. For the proposed project, it is estimated to have a maximum of 1000 workers on-site at the peak of construction. Subject to the final selection of the EPC contractor, it is anticipated that most of these construction workers will be Chinese. IFC has provided input to STC on the specific EHS related requirements to be incorporated into the contract with the EPC contractor to ensure alignment with the requirement of this Performance Standard. Further and as defined in the ESAP, STC will develop and implement a contractor management plan for the construction phase to ensure, (i) ongoing implementation of environmental and OHS management requirements by contractors; and (ii) an ongoing monitoring of the EPC contractor, and other contractors that may be engaged from time to time. Review of the contractor management plan implementation will be a key element of the independent review of the EMS and associated OHS audits as defined in the ESAP. Primary suppliers for STC operations include those providing sand and aggregates to the main HTC ready mix plant in Yangon and the suppliers of gypsum to the cement plant. Thus as per the ESAP STC will develop and implement a supply chain screening procedure to ensure suppliers are sourcing materials from government approved locations, no under age or forced labor is used by suppliers and relevant safety requirements are taken into consideration by them. Potential impacts related to key aspects such as air, noise and waste management were assessed during the ESIA and effective management thereof will require rigorous implementation of the ESMP for this phase. Independent review of ESMP implementation will be undertaken to support such an approach as defined in the ESAP. Additives to clinker to produce cement include limestone and gypsum with maximum substitution rate of 15% and 5% respectively; this will similarly apply to the expanded operations. Technical design for the new project aligns with best available technology with vertical roller mills for raw and coal grinding, roller presses for cement grinding as well as grate cooler, a 5-stage pre-heater, a 5 WM waste heat recovery system, and variable speed drives for all process fans. Process performance guarantees are to achieve 97.4 kWh per ton (kWh/t) of cement based on the clinker to cement ratio referenced above i.e., 80%, as compared to the performance of the existing line at 119 kWh/t of cement. Following commissioning of the new line the plant’s overall unit electricity consumption will be 103.4 kWh/t of cement. All the figures referenced are well within the range of the relevant industry benchmarks i.e., 90 – 150 kWh/t as defined in the Table 4 of World Bank Group (WBG) EHS Guidelines for Cement and Lime Manufacturing). The coal mine has limited energy requirements with the base camp running off generators. No assessment of HTC’s operations has been undertaken, however IFC’s energy efficiency advisory team will engage with the operations to assess potential opportunities to improve efficiency. A water reservoir has been constructed adjacent to the cement plant to provide for the plant’s operational and potable water needs. Potable water is treated in an on-site treatment plant prior to use. Currently the plant’s water consumption is 1,500 m3 per day and following the expansion on site water requirements will be 3,400 m3 per day of which some 1900 m3 per day is for the waste heat recovery system. STC is yet to evaluate the water availability in the existing catchment and have noted that they may need to source water from the Myitta River in the adjacent catchment which would require a 5 km pipeline. Thus prior to confirming the waste heat recovery unit as per the EPC contract, STC will confirm water availability and in doing ensure any extraction does not impact on in stream flow requirements of rivers allied to that of downstream users. This requirement is defined in the ESAP. Potable water at the coal mine and HTC’s operations is provided via water coolers / bottled water which is available to all staff. There is no monitoring of the potable water at the cement plant currently and this will be addressed as part of the site’s broader monitoring plan as per the ESAP. Total GHG emissions from existing operations at the cement plant equate to 550,000 tons of CO2e per annum and once the new kiln is commissioned this will total to approximately 2,000,000 million of CO2e per annum. Emissions from mine have not been quantified as yet, however relative to the cement plant these are considered limited; this component will be updated once the information becomes available. Based on the total electricity usage associated with HTC’s operations allied to fuel usage associated with transportation, the CO2 emission associated with these operations are 4,500 tons per annum. At the cement plant limestone is stored in a covered area, and clinker and cement within silos. Other materials such as coal, gypsum and mudstone are stored in the open. Similarly, at the mine the coal is stored in the open at a staging area prior to transfer to Mandalay. There is no formal management of stormwater from these areas which could thus impact on rivers / creeks in proximity which are sources for potable water for local communities. In addition, at the limestone quarry and coal mine there is no formalized approach to manage storm water and limit the potential for off-site impacts. STC acknowledge the need to address storm water related issues with specific measures already identified such as the need for sedimentation ponds to contain water prior to run off from the mine, quarry and staging area, including a formalized approach to contain storm water from areas where materials are stored in the open, and discharge of this water via sedimentation ponds. Further, there will be a need for a broader storm water plan for the expanded operations. Thus as per ESAP STC will develop a storm water management plan for the cement plant and coal mine, and implement this according to an agreed schedule. The latter will include the installation of oil water separators on areas such as at the staging areas for vehicles and adjacent to workshop areas if applicable. At the ready mix plants roads are regularly cleaned and the larger sites have a mechanical dust sweeper. Storm water from these areas discharges into the municipal storm water systems. The access road to the coal mine from the base camp is currently reconstructed every year following the wet season. This road runs adjacent to and at some points crosses a creek. The resulting impact of having to construct the road every year is that there is ongoing erosion and sedimentation into the creek when the road washes away annually. STC is in the process of constructing a new road to the site and has agreed to only use the existing road for one more season following which the road will be decommissioned. While impacts related to this activity have been assessed in the ESIA, STC will review alternatives for the location of the road to ensure that selected is the most optimal so as to limit potential environmental impacts relative to biodiversity and aquatic resources. Potential noise impacts during cement plant operations were assessed in the ESIA on potential receptor, i.e., the villages and accommodation areas. The findings indicated no exceedances relative to the day time and night values i.e., 45 dBA and 55 dBA as defined in the WBG General EHS Guidelines. Since the limestone quarries are further away from the residential communities, the noise and vibration impacts (due to blasting) were found to be insignificant as per the ESIA study. Potential noise impacts associated with the coal mine were also assessed in the ESIA and were considered to be negligible as there are no residential communities or sensitive receptors in the vicinity. Given the locality of the HTC operations within industrial areas noise is not considered as an issue. Assessment of the impact on air quality associated with the cement plant operations with necessary air quality modelling was undertaken as part of the ESIA. Primary pollutants assessed included PM10 and PM2.5, NOx, NO2, and SO2. Ambient concentrations of pollutants were monitored by ERM over a month and data from the previous EIA reports by the local consultant in 2016 was also used to assess the baseline conditions. Based on these results the airshed in the area is defined as “non-degraded”. Key receptors assessed in the air modelling included the villages of Kubyin and Pyi Nyaung, and the various accommodation units. Point source emissions included in the model are the stacks at the cement plant (current and future), general fugitive emissions from the plant and those from the mudstone and limestone quarries. As per the EPC contract, point source emissions need to comply with the WBG EHS Guidelines for Cement and Lime Manufacturing (Table 1) and data provided by STC for the existing kiln indicates that the emission values for key parameters i.e., NO, SO2 and PM, also comply with the Guideline values (Note: National legislation for point sources emissions is similar to that of the WBG EHS Guidelines). Continuous monitoring is to be installed on the new kiln and based on this emission values will be verified. As per the results of the air quality modelling exercise, the ambient concentrations will be below the WHO ambient air quality guidelines for the respective parameters and the impact is defined as moderate or below in the ESIA; the national legislative requirements for the ambient air quality too are similar to those of the WHO. Air quality modelling was similarly undertaken for the coal mine inclusive of the staging area and concentrations are estimated to be all below the WHO ambient air quality guidelines with impacts defined as negligible in the ESIA. At HTC the main plant in Yangon has a road sweeper that is used four times a day and all plants are regularly swept to manage dust on open areas. Areas where the aggregates are stored have water suppression units and cement silos at all facilities have air filtration units. Given these facilities are all located in industrial areas, the impacts of these operations on air quality are considered limited. Ablution facilities at the mine are via pit latrines, while at the HTC operations these are discharged into septic tanks for the facilities located outside of Yangon in smaller towns. In case of Yangon, where most of the operations exist, the domestic wastewater is discharged into the municipal sewerage system. At the cement plant sewerage is discharged into septic tanks or pit latrines are used in some of the outlying staff accommodation areas. At the new accommodation village being constructed all sewerage will be discharged via septic tanks. At the time of the appraisal waste water from the canteens was being disposed of directly into the adjacent creek, however STC has since moved the kitchens and started constructing a formalized approach to the disposal of this water which includes installation of grease traps. Going forward STC will review the approach to waste water management i.e, sewerage from the new accommodation village, and waste water from the kitchens and contractor camp. The focus will be to ensure the adequacy of the disposal methods relative to the capacity requirement for such and compliance with national discharge waste water quality requirements which align with the WBG EHS General Guidelines. Given the cement operations do not require any process water, no other waste water is generated by the cement plant. There is no formalized approach to solid waste management at any of the operations. Aside from refractory bricks from the kilns and empty paint / oil containers and the like, solid hazardous waste from all the various activities is limited. Currently such waste is stored on-site. The primary hazardous waste generated at all the operations in used oil which is either sold to recyclers or companies for alternative uses e.g., lubrication. This waste is typically stored in drums on open areas. Thus as per the ESAP STC will ensure that there is a designated covered, bunded area for used oil storage all operations. The cement plant is currently in the process of establishing a landfill area for domestic solid waste, while the domestic waste associated with the mining operations is disposed of in a pit and burnt. Domestic waste from HTC’s operations is collected within a designated area on site and then collected and disposed of by the respective local municipality. As described in the ESAP, a formalized waste management plan is required for all operations and this will define the approach to managing and disposing of hazardous and nonhazardous waste. For purposes of the coal mine and cement plant this may require ad hoc transport and disposal of hazardous wastes to the closest municipal area with a formal waste disposal site. At the cement plant and coal mine there are above ground storage tanks (AST) for diesel, while at the cement plant there are also above ground tanks for heavy fuel oil (for startup of the kiln). Of all the HTC operations, there are only two small AST’s and one underground storage tank for fuel. None of the AST’s are bunded and thus STC will bund all tanks in accordance with the standard practice for fuel storage; this requirement is defined in the ESAP. At the cement plant, mine and ready mix plants there are designated oil / paint storage areas. However, these areas are typically in the open in unbunded areas, though they are hard standing. Thus STC will define an approach to the storage of all hazardous materials including used oil to ensure these are within contained and covered areas and with access control granting access only to authorized personnel. This requirement is detailed in the ESAP. Within the confines of the cement plant allied to access to the respective quarries the road infrastructure is adequate. In respect of the mine, the access roads are only for the use of STC for the most part and thus potential impacts on the public are limited. The limestone quarry operation includes blasting, however, given the distance from the nearest communities, the impacts are expected to be insignificant. In any case, the company has robust processes for storage and handling of explosives and standard safety procedures for the blasting operations. Currently the cement plant has 33 vehicles transporting cement, 7 of which are for bulk transport. The remaining cement is all collected by customers. The number of vehicles owned by the cement plant once the plant has been expanded is still to be confirmed. At full project capacity, up to 400 (mainly third-party) vehicles including medium and large trucks will access the site on a daily basis. At the time of the appraisal STC had already established an area for drivers to rest / eat under cover inclusive of ablution facilities which is located adjacent to the plant access gate. Currently informal economic activities at the entrance to the cement plant are limited and there are no dwellings. Access to the cement plant is via a good hard standing road constructed by STC which then links to the main road between Thazi town and Taunggyi. Traffic volumes on these roads are limited and as per the ESIA the impact of traffic associated with the project is considered to be moderate. Various mitigation measures have been defined in the ESIA including the need for expanding the areas for drivers and developing vehicle staging areas adjacent to the access gate to the plant. These requirements are defined in the ESAP allied to the need for a formal driver training program at the cement plant and mine to focus on aspects related to health and safety. HTC has 155 heavy vehicles of which 102 operate in Yangon. In addition, 5 independent vehicles provide services to them. Vehicles are subject to daily and monthly inspections and maintained according to a planned schedule. Monthly safety training is provided to drivers and the police provide ad hoc training as well. Influx is not expected to be significant given the project’s remote location and limited manpower requirement during the operational phase. However, the impacts due to the influx of foreign workers during the construction phase could be significant. Communicable diseases, including sexually transmitted diseases, could become more prominent with the influx of foreign construction labor given the potential for increased interactions with local community members. During construction this will be managed via the contractor management plan. Further, building on the company’s support to local clinics, STC will develop an overall Community Health Program (CHP) covering both the cement and coal mining operations focused on raising local awareness on health issues and providing health checkup programs, etc. The CHP should be sensitive to the potential vulnerability of women and other gender groups. Information on the CHP will be reported to IFC on a regular basis via the Annual Monitoring Report. This action is defined in the ESAP. Outsiders could compete for local natural resources (e.g. if they enter forest areas and engage in hunting or logging activities) and increased sanitary wastes (e.g. discarding trash without restrain) from influx could pollute the local environments. These aspects will be addressed via implementation of the ESMP for the construction phase allied to the contractor management plan. Issues associated with ecosystems services are addressed in PS6 below and associated mitigation measures defined. The company currently has in-house, unarmed security guards at its cement, quarry, and coal mining sites and security guard posts at main entrances. There have been no known security incidents in the past involving staff, contractors, or communities. At the HTC operations security is provided via a combination of the permanent workers and third parties; all guards are unarmed. The cement plant and quarry concessions overlap the Northern Indochina Subtropical Forests ecoregion. The mine concession overlaps with the Mizoram-Manipur-Kachin Rainforests ecoregion. Both ecoregions form part of the Indo-Burma Biodiversity Hotspot. IFC screened the project using the Integrated Biodiversity Assessment Tool (IBAT). The local EIAs were undertaken for the cement plant and coal mine included surveys for fish, mammals, herpetofauna, birds and insects. Additional PS6-compliant biodiversity assessment and surveys were initiated as part of the ESIA. The updated ESIA includes a Critical Habitat Assessment. Targeted karst surveys were designed and conducted in conjunction with NGOs and international species experts (e.g., Fauna & Flora International). The cement plant and mudstone quarry concessions are considered largely modified habitat, while the limestone quarry concession comprises Natural and Critical Habitat. In total, 268 hectares of Natural Habitat and 202 ha of Modified Habitat will be impacted during construction and operations (e.g., land clearing, potential staff/contractor exploitation of wildlife and forest resources, edge effects) within the cement plant and quarry concessions. The cement plant and quarry concessions are considered Critical Habitat for; i) Critically Endangered and Endangered species (2 mammals, 1 plant); ii) Restricted Range or endemic species (4 snails); iii) Highly Threatened and/or unique ecosystems (karst ecosystems); and iv) key evolutionary processes (karst ecosystems). The majority of Critical Habitat values, including some species potentially new to science, are associated with the Shan Plateau, an extensive karst ecosystem (150,000 hectares) with which the limestone quarry concession partially overlaps (0.2% of Shan Plateau). However, none of the karst species identified are restricted to the limestone quarry concession, and are known to occur to the north and possibly south of the limestone quarry concession. It is estimated that 151 hectares of this karst ecosystem (0.0001% of Shan Plateau or 65% of limestone quarry concession) will be impacted within the limestone quarry concession during its expected lifetime of over 40 years. Critical Habitat screening for karst reptile and flora are pending final wet season surveys results. Given the limestone quarry is already defined as Critical Habitat and the proposed offset for the limestone quarry is based on a similar habitat, it is anticipated that the outcome of wet season data will not significantly affect the findings on biodiversity as defined to date. Where new species are identified, ERM or the relevant subcontractor will ensure the requisite protocols for such are followed. The coal mine concession comprises Natural Habitat, however also meets criteria for Critical Habitat. Most of this habitat is of good quality given it has been inaccessible until recently, though degraded and exploited sites were observed. In total, 885 hectares of Natural Habitat and 3 hectares of Modified Habitat will be impacted at the mine during construction and operations (e.g., land clearing, staff/contractor exploitation of wildlife and forest resources, fragmentation and edge effects) within the mine concession. The mine concession is Critical Habitat for Critically Endangered and Endangered species (4 mammals, 4 plants). Due to the high threat of wildlife, wood product and forest resource exploitation, further details on the identity and locations of Critical Habitat values have been fully assessed in the ESIA report disclosed together with this ESRS, but details on species names and their locations have not been described here. As noted the ESIA assessed the impact of the new 5 km road to the coal mine and biodiversity offsets as required for habitat impacts have been taken into consideration. However, as per the ESAP, alternative alignments for the road are to be assessed to ensure the alignment selected limits the associated impacts of constructing the road. The ESIA has defined measures to avoid (e.g., marking out of on-site set asides, hunting ban for staff), minimize (e.g., patrolling to reduce third party hunting or logging, speed limits) and rehabilitate (e.g., via the mine rehabilitation plan) impacts to Natural Habitats within the cement plant, quarry concessions and mine concession including the access road. These aspects will also be managed via implementation of the ESMP for the respective project phases. Significant residual impacts are expected due to habitat loss in Natural and/or Critical Habitats, and offsets will thus be required. A Biodiversity Offset Strategy has been developed as part of the ESIA in consultation with local government agencies and NGO experts (e.g. Fauna & Flora International, Wildlife Conservation Society). The strategy explicitly considers recent independent national-level assessments by national and international partners (e.g., Biodiversity and Nature Conservation Association, Instituto Oikos, Wildlife Conservation Society) of the context, current status and challenges to protected areas in Myanmar, as well as sustainable financing options for these. Offsets based on support to existing but threatened protected areas are being assessed as part of the strategy, as well as purchase of other concessions to create/expand protected areas in areas of equivalent habitat. The mudstone quarry concession associated with the cement plant is leased from the Forest Department and STC is legally required to pay the Forest Department to offset the loss of forest cover with an area equal to 20% of the mudstone quarry concession. This area has been established on the western side of the access road opposite the security check point to the cement plant and is planted with teak forest. This offset is designed to compensate for lost timber values and is not considered as a contribution towards the requirements for no net loss or net gain. The Biodiversity Offset Strategy will form the basis for the Biodiversity Action Plan (BAP), including a Biodiversity Monitoring and Evaluation Plan (BMEP), to deliver no net loss for Natural Habitats and net gain for Critical Habitat values. IFC has secured funding to assist STC in development of the BAP and BMED and the requirement for these plans is defined in the ESAP which will be finalized after the pending wet season assessments are completed. The cement plant / quarry concessions and mine concession do not overlap with any known protected areas or internationally recognized areas. The cement plant is 6 km south of the Panlaung-Pyadalin Cave Wildlife Sanctuary (IUCN Cat. IV) and Key Biodiversity Area. The mine is 4.6 km west of the Maharmyaing Wildlife Sanctuary (IUCN Cat. IV) and Important Bird Area. There is potential that these areas may be impacted by induced access for exploitation of wildlife and wood products. Alien invasive species are established in the area of the cement plant (11 plant species, 1 snail identified) and mine (12 plant species identified). These species are likely to benefit from any disturbed sites within the cement plant and quarry concessions and mine concession. The ESIA has defined measures to avoid spreading invasive species to new areas (e.g., vehicle wash down), control them within Natural Habitats under client control (e.g. via herbicides), and to monitor and avoid accidental/unintended introductions of new invasive species. These actions will form part of the ESMP for the project’s operational phase implementation which is a requirement in the ESAP. Priority ecosystem services present at the cement plant and quarry concessions and the mine concession include dependence on wood products and freshwater services by local communities. Erosion regulation associated with forested areas is present in the mine concession. Wood product and forest resource use, though a priority ecosystem service, also presents a major contextual risk to the project. Prior to STC setting up the current cement and mining operations, there has been widespread pre-existing legal and illegal (as defined by Myanmar law) exploitation of forest resources both at the project footprint areas and in nearby forested areas. Previously, access to forested areas in the vicinity of the plant was limited to ox carts for decades, however access by machinery and large vehicles (by both local community members and outsiders) has been facilitated by the upgraded access road. This has resulted in an increase in deforestation within the area for which STC has concessions (except for the limestone quarry area as directed access can only occur via STC vehicles to this area) and forested areas adjacent to the concessions. This enhanced access has also facilitated increased exploitation of wildlife, which may be further exacerbated as the project expands its capacity resulting in an influx of outsiders into project and adjacent areas during both construction and operations. In company controlled concessions and access roads, access by non-authorized personnel and mechanized vehicles/equipment will be prohibited by the company to ensure that illegal removal of forest resources does not occur therein. The company will also develop and implement a corporate policy to prohibit the extraction, purchase, use, or trade of illegal timber by employees, contractors, subcontractors, and business partners. Further, potential exploitation of forest products e.g., wildlife, by contractors during the construction phase will be addressed via implementation of the project’s ESMP for this phase. Associated actions are defined in the ESAP. In areas and access roads which are not under the company’s control, STC’s ability to manage this contextual risk is very limited. However, STC has noted that it will work with the relevant authorities and other stakeholders to the extent possible to address this issue. In addition, the company should support efforts by NGOs or other community development organizations to help local communities transition from illegal extraction of forest products to more sustainable livelihoods. Due to the closely-linked and often inseparable nature of livelihood development, biodiversity conservation, and stakeholder engagement, the above actions will need to be developed and implemented in coordination with the development and implementation of the Biodiversity Action Plan described earlier, and the Stakeholder Engagement Plan referenced in the following section. In doing so, the respective plans will need to articulate which actions and responsibilities relate to impacts directly attributable to the project, and those which support third-party efforts unrelated to the project. The aspect is addressed in the ESAP. Stakeholder engagement activities undertaken to date by the project includes; i) consultation with local communities undertaken in 2013-2014 and 2015-2016 as part of the local EIA’s for the coal mine and the cement/quarrying operations; ii) consultation as part of the ESIA which was undertaken with all the local communities of Kubyin/Pyi Nyaung (cement/quarrying area) and Chaungzon/Paluzawa/Nanmawke (coal mining area); the latter used focus group meetings, household interviews, and questionnaires during socio-economic baseline surveys; and; iii) interactions to some extent with community members directly by IFC during the field appraisal. In addition, various government departments have been engaged along with several international conservation NGOs in relation to biodiversity impacts and issues in the study areas. Community members consulted during the ESIA and during IFC’s site visit generally expressed a positive view towards this project and described it as important for local development. In addition, since the cement plant commenced operations there are day to day interactions between company personnel at the cement plant and mine and village heads, local officials, and community members. These are informal interactions as the company does not currently have a structured stakeholder engagement program or grievance mechanisms in place. Further, there have been ongoing engagement between the company with the Ministry of Environmental Conservation and Forestry officials at a national and regional level on forest protection and other issues. The company has supported the establishment of local health clinics, staffed by medical personnel who regularly visit the various villages to check on their health status. Community members noted their appreciation for the enhanced health service access enabled by the company’s efforts in concert with the Government. Malaria is highly prevalent in local areas mainly in forested areas e.g. over 100 known cases in the past 3 years in the coal mining area, and over 800 cases of high fever. The local clinics supported by the company provide initial diagnosis and treatment to affected community members, provide bed nets, and arrange for them to be transported to larger medical facilities in nearby towns when required. Going forward the company shall develop and implement a systematic Stakeholder Engagement Plan (SEP) for the cement plant and coal mine which will include: overall objectives, stakeholder analysis and mapping, implementation procedures, budget and resource plan, key performance indicators (KPI) and targets, assigned roles and responsibilities, incentives, and a grievance redressal mechanisms (GRM). The SEP will be part of the company’s overall EMS to be developed (refer to PS1 and ESAP). For the development of the SEP a qualified social specialist shall be commissioned by the company. SEP implementation procedures will specify day to day engagement activities for assigned STC staff to undertake, aimed at fulfilling pre-defined social risk management KPI targets (e.g., >90% grievances addressed by pre-set timelines) and relevant elements of the Biodiversity Action Plan. SEP activities will include appropriate community development programs (e.g., community health checkup; sustainable forest-based livelihood development program; etc), which will be designed and implemented to clearly and strategically contribute to a certain SEP objective or KPI’s. As stated under PS6, where an action in the SEP relates to an induced impact not attributable directly to the project, this will be articulated clearly in the SEP.
SEP implementation will importantly include: (i) designing the GRM to be easily accessible and communicating it to key stakeholder groups particularly local communities (e.g. through handing out pamphlets, etc), so that all groups are aware of the mechanism; ii) an appropriate database/register which records all grievances received by the company and how these have been addressed; (iii) bi-annual reporting of project related environmental and social issues, impacts, and mitigations to local communities and other key stakeholders; and (iv) mechanisms to consider and incorporate ongoing stakeholder feedback to enhance aspects related to construction and operations. Review of implementation of the SEP will be undertaken as part of the broader EMS review and the company will implement findings accordingly. Ongoing information on SEP implementation will also be provided via the AMR to be submitted to IFC and will include information and statistics on the functioning of the grievance mechanism. For purposes of the HTC operations (including its fleet of heavy vehicles), a grievance mechanism will be developed and implemented so to track potential complaints and queries, and ensure these are addressed accordingly. This requirement is defined in the ESAP. The ESRS, ESAP and ESIA (March, 2017) will be disclosed on the World Bank Infoshop and the ShweTaung Group website. In addition, information on the project may be requested from the individuals at the STC office in Yangon and the cement plant as per the contact details below. Company Name : Shwe Taung Cement Co., Ltd.
Upgrade the existing environmental and occupational health and safety (OHS) management systems at the cement plant (including the quarries) and mine to align with the requirements of ISO 14001 and OHSAS 18001 including Performance Standard 1 and relevant World Bank Group (WBG) Environmental Health & Safety (EHS) Guideline requirements. Aspects to be included in the management systems are as follows: • The requirements defined in the ESMP for construction and operations as included in the Environmental and Social Impact Assessment (ESIA) for the project (March, 2017) and specifically; i) a waste management plan defining on-site practices and disposal methods for hazardous and domestic solid and liquid waste; ii) a plan for the storage of all hazardous materials that is aligned with Good International Industry Practice (GIIP) for such and ensures bunding of above ground tanks where applicable; iii) a traffic management plan inclusive of; a) adequate staging areas for vehicles; b) facilities and amenities for drivers; and c) a formal training program for drivers in the employ of the cement plant and mine; iv) emergency response plans and procedures; v) monitoring plans for; a) workplace parameters where applicable (e.g., noise, illumination, temperature); b) incident reporting and root cause analysis against internationally accepted OHS metrics; c) potable water; d) point source emissions, among others; and vi) management reporting requirements. Extend relevant aspects of the environmental and OHS management systems referenced above i.e., that relates to solid waste management, hazardous materials storage, incident reporting, to HTC’s operations. Appoint suitably qualified independent specialists against agreed Terms of Reference to:• Undertake an initial baseline audit of environmental and OHS systems and procedures at the cement plant and mine. Based on the findings thereof, define an agreed time based plan to ensure alignment with the management systems requirements outlined above including human resource and budget requirements to ensure effective implementation of the systems inclusive of the Stakeholder Engagement Plan (SEP) and the Biodiversity Action Plan as referenced below; • Undertake ongoing review and support to STC over an agreed time period to ensure effective implementation of the referenced management systems including implementation of the SEP at the cement/quarry/mine SEP; and• Regularly review implementation of the ESMP for the construction and operational phases including the contractor management plan for the new cement plant. Review and assess alternative alignments for; i) the new road to the coal mine to ensure that selected is the most optimal in limiting potential environmental impacts relative to biodiversity and aquatic resources; and ii) the new transmission line to ensure the alignment selected maximizes usage of the existing right of way and thereby limits potential impacts. In undertaking the assessments, obtain independent, qualified environmental support. Appoint an experienced Environmental, Health and Safety Manager for the cement plant (supporting personnel requirements will be defined via the audits referenced above) with a direct line of reporting to the STC CEO. Develop and implement a Stakeholder Engagement Plan (SEP) for the cement plant and mine which includes the requirements as defined in the Environmental and Social Review Summary document inclusive of a readily accessible grievance redress mechanisms (GRM). The SEP is to include the requirement for bi-annual reporting to communities. Extend this grievance mechanism to HTC. Develop and implement a supply chain screening procedure for raw materials that applies to; i) bulk raw materials supplied to HTC; and ii) bulk raw material e.g., gypsum, coal, supplied to the cement plant The focus thereof is to ensure suppliers comply with national legislation, source materials from approved locations, do not use any child or forced labor, source locations do not significantly convert natural/critical habitats, and appropriate safety requirements are implemented in the supply process. Develop and implement an anonymous reporting mechanism for workers associated with the cement plant, quarry, mine and HTC. Develop and implement a supply chain screening procedure for raw materials that applies to bulk raw materials supplied to HTC; and ii) bulk raw material e.g., gypsum, coal, supplied to the cement plant The focus thereof is to ensure suppliers comply with national legislation, source materials from approved locations, do not use any child or forced labor, source locations do not significantly convert natural/critical habitats, and appropriate safety requirements are implemented in the supply process. Develop a stormwater management plan for the cement plant and mine to ensure adequate containment of stormwater following discharge off-site, inclusive of sedimentation ponds, and prior to discharge of such water to natural water courses. Thereafter, implement the plan according to an agreed time based schedule with IFC. Commission an independent engineer to assess on-site waste water management practices at the cement plant including the contractor camp. This is to include waste water associated with all ablution facilities and kitchens. The assessment is to develop practical recommendations to ensure waste water disposal methods can accommodate the capacity requirement for such so as to comply with national discharge waste water quality requirements. Based on the finding thereof, implement the associated recommendations in accordance with a time based plan agreed with IFC. Prior to including design and construction of the waste heat recovery unit in the EPC contract, undertake as assessment to confirm water availability for the unit. Such availability is to ensure the impact on instream flow requirements and downstream user requirements associated with the water resource from which extraction occurs is acceptable. Develop and implement quarry (mudstone and limestone) and mine closure and rehabilitation plan aligned with GIIP and complete with cost estimates. Develop and implement a gender-sensitive Community Health Program (CHP) for the cement plant, quarry and mine that includes a program to raise local awareness on health issues and health checkup programs. Reporting thereon will be via the Annual Monitoring Report. Develop and implement a policy that ensures no access at all times by non-authorized personnel and mechanized vehicles/equipment on company owned roads and areas under its control inclusive of the road to the coal mine so as to limit the potential for illegal loggers to access the company’s concessions or adjacent areas via the concessions. Develop and implement a policy and associated systems and procedures inclusive of appropriate sanctions/contract termination actions that prohibit employees and/or contractors from possession, purchase, trade or collection of wildlife or forest resources that are legally protected, CITES listed, or classed as threatened by the IUCN Red List. Commission a qualified independent consultant and/or organization/NGO to support development and implementation of the Biodiversity Action Plan (BAP) so as to achieve no net loss of Natural Habitats, and net gain of Critical Habitat values aligned with the Biodiversity Strategy as compiled in the ESIA. The BAP will include a Biodiversity Monitoring and Evaluation Plan (BMEP). Development and implementation of the BAP and BMEP will involve qualified independent consultants and supporting organization/NGOs.